This past month, I experienced a shave, self-administered, that was the closest and the smoothest shave, ever, on my face. Now, I am into the second half of my eighth decade, and I have been shaving for a good 60 years, total. During that span, I have been treated to quite a few professional barber shaves administered with Sweeney Todd razors, though the vast majority of times that my beard has been shaven were self-administered. I never have sported a moustache/mustache or beard, but from my late teens on, I have shaved every day, seven days a week. Cumulatively, that adds up to a lot of shaves, but the one last month was the closest. 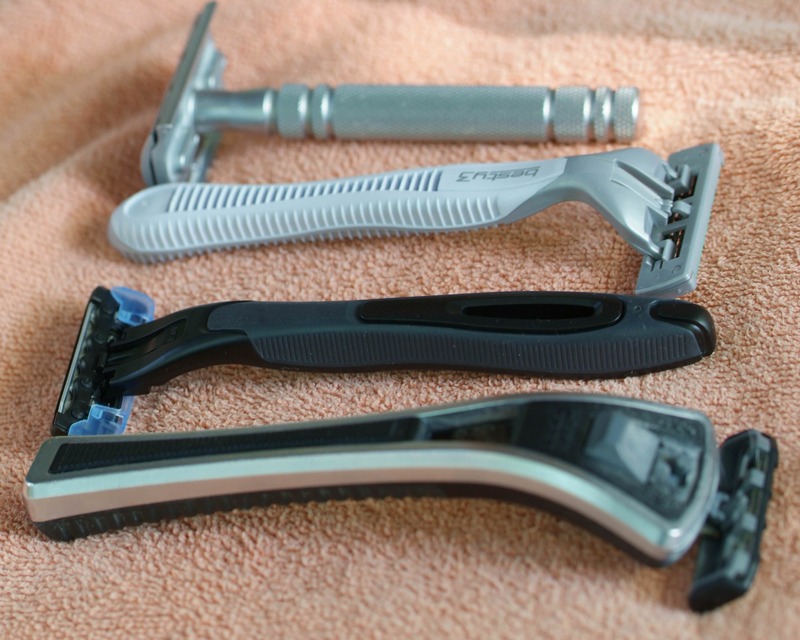 What makes the shave so remarkable is that it was accomplished with the absolute cheapest equipment imaginable: all of the components of the shave were free. Unless I can convince someone to pay me to take a razor and preparation products off of his or her hands (please introduce that person to me), one simply cannot get less expensive than free. When one takes a Proper Japanese Bath, one first fills the tub with the hottest water that you think that you will be able to tolerate; but you do not get into the tub yet. First, outside the tub, you soap up every square centimeter of your body, and scrub yourself well with the thin long towel/large washcloths provided; you can (and should) take the opportunity to shampoo your head, as well. Then, using the scoop, you take water from the tub and drown yourself, head to toe, with copious rinses. You are permitted (and encouraged) to repeat the previous steps. Then, for good measure, and still outside the tub, you use the shower facility further to rinse off from your body and head and from every angle all traces of soap and shampoo. Only then, when you have no remaining traces of body oil or soap on your skin, do you lower yourself into the tub for a relaxing soak; no soap is used in the bathtub and you do not carry the washcloth into the bathtub. It is all very sybaritic. When you emerge from the tub, every muscle of your body will be relaxed and, from the shaving standpoint, your epidermis and hair follicles all will be thoroughly hydrated. The pre-shave Proper Japanese Bath may be the real secret to achieve the remarkably excellent BBS shave that ensued. Accompanying the razor in the envelope was a single use aluminum foil packet of KAI shaving cream. This was the mystery element of the shave, because KAI shaving cream apparently is not marketed to end users in its home country; you cannot just walk into a drugstore or department store in Japan and pick KAI shaving cream off the shelf. 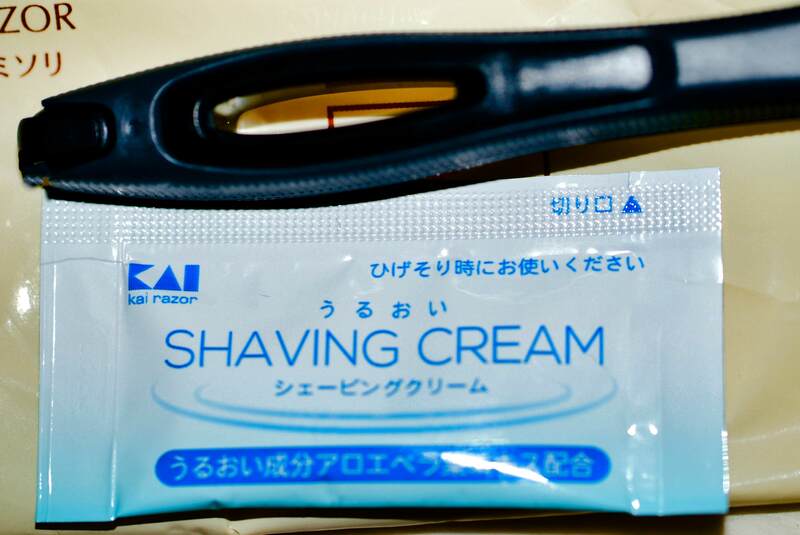 So far as I have been able to discover, KAI shaving cream is available only as a giveaway inside the nondescript plastic envelopes that contain free disposable KAI razors. One squeezes the contents of the foil pack onto one’s fingertips and smears it onto one’s beard; no KAI shaving cream remains in the foil packet. Straightway one shaves off the stubble — one pass — with the cheap disposable razor; without additional shaving cream to apply for a second or third pass, one must shave carefully to complete a single pass without missing any spots. The foil pack becomes, together with the razor, part of the municipal solid waste load. The result is in a perfect BBS, close, smooth, and long lasting. A really, really good shave. To what can we attribute such success? The thorough washing and deep soak that preceded the shave? Quite possibly. The (otherwise unobtainable) free KAI shaving cream? Maybe. Certainly, there must be some magical symbiosis among the elements. Res ipsa loquitur. A perfect BBS, the closest shave in six decades. Is it really necessary to understand the process when one can simply enjoy the results? That was a fascinating read about the bathing process. A wet-bath outside the tub! Enjoyable story. Congratulations on a great shave. I don't recall seeing that Kai cream in any of my Japanese stays, business hotels or ryokans. (11-11-2018, 08:55 PM)mike_the_kraken Wrote: That was a fascinating read about the bathing process. A wet-bath outside the tub! The hotel bathroom shown in the previous post is a miniaturized version of the communal baths that are the centerpieces of onsen (おんせん) resorts (thousands of them) throughout Japan. The bath in the photo below, located in a small resort ryokan (りょかん) in the Shima area of the Mie Peninsula, which was our destination this trip, is typical. Aside from the knotty pine walls, all of the wood in the photo below is 檜 (ひのき or hinoki), sometimes called Japanese cypress; it is very much favored in the building of Shinto shrines , such as Shingu (The Grand Shrine) at Ise, which is the central shrine of the Shinto religion. Hinoki is the first (but expensive) choice for public and private baths, also, as it stands up well to water without rotting, acts as a mild disinfectant to the water, and has a subtle but entrancing fragrance. 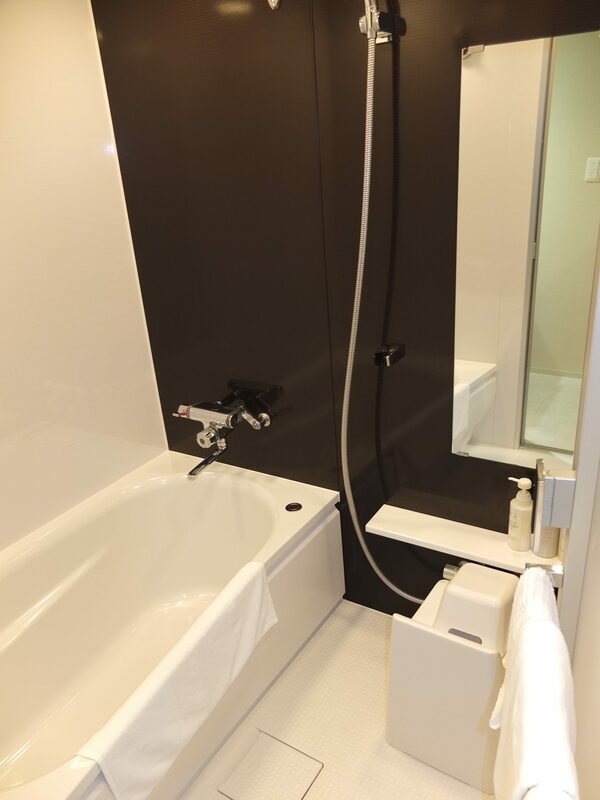 Note along the far wall, at the far right, the low hinoki stool and the round hinoki bowl, the function of which the plastic scoop in the modern hotel room emulates. By custom, if the washing station is available for use, the bowl is placed upside-down on top of the stool; if the previous user of the washing station is soaking in the tub, and plans to return to the washing station for another round, the stool and bowl are left separated. Good read on a technique that I can only fantasize about. All, except the BBS shave. I would believe that it came from the exposure to such a hot bath maybe? Which has me wondering if possibly after a sauna would give the same results? It sounds like you presented yourself with the perfect storm for a great shave. Probably a sauna would have the same effect. Someone needs to try it and report back. Thanks for sharing. As winter approaches I really miss the old communal Japanese baths. They warm you clear to the bone and talk about beard prep! This gaijin looked like a lobster exiting the furo! To this day I can't bathe western style. Haha the old stools make me recall a time I was at the public bath and the hostess was explaining my nakedness to the ladies bathing on the other side of the wall. She just about died when upon completing my bath and dressing I visited with her In Japanese. Yes, Japanese ladies can blush! Poor lady. (11-14-2018, 02:48 PM)Lipripper60 Wrote: Thanks for sharing. 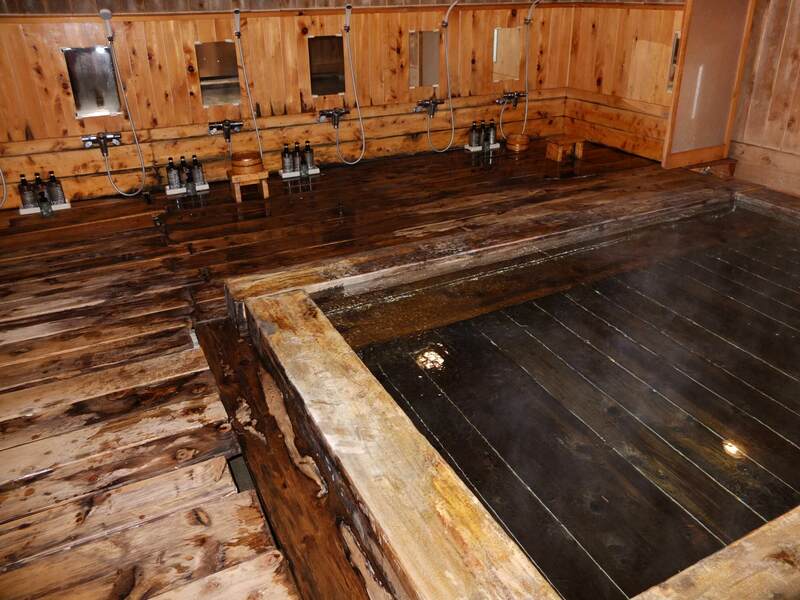 As winter approaches I really miss the old communal Japanese baths. They warm you clear to the bone and talk about beard prep! This gaijin looked like a lobster exiting the furo! To this day I can't bathe western style. Haha the old stools make me recall a time I was at the public bath and the hostess was explaining my nakedness to the ladies bathing on the other side of the wall. She just about died when upon completing my bath and dressing I visited with her In Japanese. Yes, Japanese ladies can blush! Poor lady. When I lived in an apartment in Sapporo in the 1960s, "my" bath was a public bath a block up the street. A woman, face devoid of expression, sat at the desk inside the entrance to take the money for the bath, sitting with her back to the divider between the ladies' side and the men's side; she could supervise anything that went on in either side of the bath. A friend of mine got into a bet with some Japanese friends that he could make the woman laugh; he was taken up on his bet. When the time came, he entered the bathouse, paid his fee, and, with some motional fanfare he moved to the disrobing area, where he ostentatiously removed every stitch of clothing, carefully folding each piece. Then he went over to the scale, and stepped on the platform. He read out his weight, said なるほど、got off the scale, and got dressed. Haha! Arigato ........and got dressed. That is an awesome story. My Japanese is rusty but would I translate naruhodo to mean "I thought so". (11-15-2018, 04:41 PM)Lipripper60 Wrote: Haha! Arigato ........and got dressed. That is an awesome story. My Japanese is rusty but would I translate naruhodo to mean "I thought so". As you surely appreciate, there is no direct translation for naruhodo/なるほど. Your translation, "I thought so," is pretty close. "That clears it all up" is another possibility. "Finally, I get it" might be another.